Most agree that the cause of this osteochondritis is a combination of both traumatic and vascular insults.1 For example, any biomechanical issue that may cause increased loading of the second metatarsal may result in repetitive stress to the metatarsal. Hallux valgus, hallux rigidus or an elongated second metatarsal can all be contributing factors. Some even hypothesize that high heel shoes worn by women may result in increased stress incurred by the second metatarsophalangeal joint (MPJ). In addition, any vascular compromise to the vessels supplying the metatarsal head and neck may result in necrosis of the bone. Arthroplasty of the joint may also be an option. Interpositional arthroplasty can attain satisfactory results. This procedure consists of interposing the extensor tendon between the joint and suturing it plantarly to the plantar plate. Studies have shown long-term improvement in pain but range of motion of the joint did not seem to increase.8 In the case of arthroplasty, we prefer to make an “anchovy” out of a tubularized tendon placed in the joint to act as a spacer and prevent shortening. Place the tendon in the arthroplasty site and pierce it with a K-wire that goes from the distal tip of the toe into the joint. Spinning the K-wire then spins the tendon into a ball. Then place the tendon into the resection site and advance the K-wire into the metatarsal. The next option for surgical treatment, if simple cleanup is not sufficient, would be some form of metatarsal osteotomy. The goal of this procedure is to allow for the healthier portion of the plantar cartilage to better articulate with the base of the proximal phalanx. One can accomplish this by performing a dorsal closing wedge osteotomy of the metatarsal head. In one study, surgeons performed the aforementioned procedure on 10 female patients.9 Six of the patients presented with a type IV Freiberg’s infraction while the remaining four were classified as having a type V Freiberg’s infraction. All patients healed uneventfully and were able to return to normal activity. Some mild loss of passive dorsiflexion and plantarflexion occurred, but this did not cause any disturbance in gait. Another study found similar positive results with a similarly modified Weil technique in which surgeons removed a dorsal wedge and rotated healthier plantar cartilage dorsally.10 Nineteen patients with both early- and late-stage disease had an osteotomy, and demonstrated significant increases in AOFAS scores. Range of motion of the joint also increased significantly and all patients reported good to excellent results with the exception of one patient who complained of postoperative stiffness. How Effective Are Emerging Surgical Techniques? Newer techniques attempting to salvage the joint by repairing the cartilage are slowly coming to fruition. One author describes using the OsteoCure™ (Tornier) bone graft for repair of a stage II Freiberg’s infraction on an active 15-year-old female.11 By six and 12 months in the study, the polymer had reabsorbed and replaced the natural hyaline cartilage of the joint. The procedure entails removal of the diseased cartilage and subchondral bone with insertion of the orthobiologic material. The patient remains non-weightbearing in a splint for four weeks followed by a two-week period of partial weightbearing. In the reported case, the patient was pain free with increased range of motion at her last postoperative visit. Tsuda and his colleagues performed a similar technique but used the Osteochondral Autograft Transfer System (OATS, Arthrex) with the ipsilateral lateral femoral trochlea as the donor site.12 The other noteworthy difference was the postoperative course, which consisted of heel weightbearing and immediate active toe flexion exercises. Full weightbearing began at two weeks and the patients performed active toe extension exercises as well. At six to 12 weeks, the patients were allowed to return to full sports activities in a custom orthotic. The study authors reported that in the three cases of stage III to IV Freiberg’s infraction, all patients had an improvement in symptoms and a prompt return to sports. In a slightly different version of the procedure, DeVries and colleagues performed an OATS procedure on a 15-year-old female with progressive second metatarsal head disease.13 Surgeons employed a mini external fixator to distract the joint by 7 mm. The patient maintained partial weightbearing in a below-knee boot for six weeks and the surgeons removed the fixator at six weeks. At 15 months postoperative, an MRI revealed excellent incorporation of the graft and the patient had returned to full activity with minimal discomfort. Joint destructive procedures are also an option for either patients with extremely advanced disease or those who have failed more conservative approaches. Although metatarsal head resection is always a viable option, this may not be a plausible choice for a young, healthy patient. Researchers have described implant arthroplasty with a silicone implant with fair results.14 Complications with these implants include implant failure, transfer metatarsalgia, synovitis with bone resorption and infection.1 More recently, surgeons have utilized resurfacing procedures of the second metatarsal head with a hemi-implant.15 This allows for preservation of range of motion as well as a proper metatarsal parabola. Although the second metatarsophalangeal joint fusion is not a routinely utilized procedure, it has slowly gained some favor for severe second MPJ pathology. Karlock first described the procedure for severe crossover deformity of the second digit.16 Ten out of 11 patients related good to excellent results while one patient experienced a symptomatic non-union. The one significant setback that one would find with performing an arthrodesis on an avascular second metatarsal is the need to resect the devascularized bone prior to fusion. This would necessitate the use of a bone graft for adequate length preservation. Internal fixation may pose a difficulty considering the small area but one can augment internal fixation with a mini external fixation device. The other crucial component when inserting a larger bone graft is damage to the digital neurovascular structures. It is clear that more studies are necessary on this approach to second MPJ pathology. Treatment for Freiberg’s disease depends highly on the stage of the disease and the surgeon must take into account any previous procedures that the patient has had at the joint. It is critical to consider the patient’s age and activity level when making a decision on the appropriate surgical course. Overall, patients undergoing surgical treatment for osteonecrosis of the second metatarsal head progress with relief of symptoms and a return to their desired daily activities. Dr. Baravarian is an Assistant Clinical Professor at the UCLA School of Medicine. He is the Chief of Podiatric Foot and Ankle Surgery at the Santa Monica UCLA Medical Center and Orthopedic Hospital, and is the Director of the University Foot and Ankle Institute in Los Angeles. Dr. Ben-Ad is a Fellow at University Foot and Ankle Institute in Los Angeles. 1. Cerrato RA. Freiberg’s disease. Foot Ankle Clin N Am. 2011; 16(4):647-58. 2. Mah CD. Freiberg’s disease. Podiatry Institute Update. Ch. 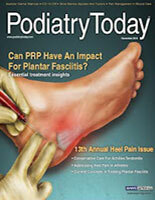 4, Podiatry Institute Publishing, Tucker, Ga., 2008, pp. 13-15. 3. Smillie IS. Treatment of Freiberg’s infraction. Proc R Soc Med. 1967; 60(1):29-31. 4. Torriani M, Thomas BJ, Bredella MA, Ouellette H. MRI of metatarsal head subchondral fracture in patient with forefoot pain. AJR Am J Roentgenol. 2008; 190(3):570-75. 5. Capobianco C. Surgical treatment approaches to second metatarsophalangeal joint pathology. Clin Podiatr Med Surg. 2012;29(3):443-49. 6. Kilic A, Cepni KS, Aybar A, et al. A comparative study between two different surgical techniques in the treatment of late-stage Freiberg’s disease. Foot Ankle Surg. 2013;19(4):234-8. 7. Carmont MR, Rees RJ, Blundell CM. Current concepts review: Freiberg’s disease. Foot Ankle Int. 2009;30(2):167-76. 8. El-Tayeby HZ. Freiberg’s infraction: A new surgical procedure. J Foot Ankle Surg. 1998;37(1):23-27. 9. Al-Ashhab ME, Kandel WA, Rizk AS. A simple surgical technique for treatment of Freiberg’s disease. Foot. 2012;23(1):29-33. 10. Kim J, Choi WJ, Park YJ, Lee JW. Modified Weil osteotomy for the treatment of Freiberg’s disease. Clin Orth Surg. 2012;4(4):300-6. 11. Kline A. Freiberg’s infraction of the second metatarsal head with bioorthologic repair using the NEXA Osteocure™ bone graft: A case report. Foot Ankle J. 2008;1(11):4. 12. Tsuda E, Ishibashi Y, Yamamoto Y, et al. Osteochondral autograft transplantation for advanced stage Freiberg’s disease in adolescent athletes: a report of 3 cases and surgical procedures. Am J Sports Med. 2011;39(11):2470-75. 13. DeVries JG, Amiot RA, Cummings P, Sockrider N. Freiberg’s infraction of the second metatarsal treated with autologous osteochondral transplantation and external fixation. J Foot Ankle Surg. 2008;47(6):565-70. 14. Cracchiolo A 3rd, Kitoka HB, Leventen EO. Silicone implant arthroplasty for second metatarsophalangeal joint disorders with and without hallux valgus deformities. Foot Ankle Int. 1988;9(1):10-8. 15. Goecker RM. Lesser metatarsal head resurfacing procedure for Freiberg’s infraction. Podiatry Institute Update, chapter 2, 2010, pp. 5-10. 16. Karlock LG. Second metatarsophalangeal joint fusion: A new technique for crossover hammertoe deformity. A preliminary report. J Foot Ankle Surg. 2003;42(2):178-82.